Kennesaw Mountain National Battlefield Park is situated on granite hills covered with conifer and hardwood forests and streams located northwest of downtown Atlanta. The 2,884-acre park preserves a Civil War battleground of the Atlanta Campaign, during which General William T. Sherman captured Atlanta. 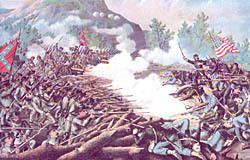 Kennesaw Mountain was the last major natural obstacle which the Confederate Army fortified to protect Atlanta from the Union Army's advance at the end of June 1864. Fighting occurred here from June 18, 1864, until July 2, 1864. Sherman's army consisted of 100,00 men, 254 guns and 35,000 horses while Confederate General Joseph E. Johnston had an army of 50,000 men and 187 guns. The Confederates lost 800 soliders killed during the campaign compared to 3,000 Union soldiers, while over 63,000 more soldiers were wounded or captured. Although these battles were Confederate victories, General Sherman's flanking movements in the following days caused the Confederate troops to withdraw to the safety of defenses ringing Atlanta on July 2. Union forces later surrounded Atlanta and a series of Confederate attacks to break the Federal siege ended in defeat, causing the evacuation of Atlanta. The city was surrendered to Sherman on September 2. Atlanta's capture helped President Abraham Lincoln win re-election and crippled the South's ability to continue fighting against the Union. 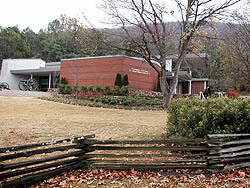 There are three battlefield areas at the park--the main site is located at Cheatham Hill, the other two are in front of the Visitor Center and off Burnt Hickory Road. While walking some of the 17.3 miles of interpretive walking trails visitors encounter historic earthworks, cannon emplacements and various interpretive signs. There are three monuments representing groups that fought here. Kennesaw Mountain National Battlefield Park, administered by the National Park Service, is located three miles northwest of Marietta, Georgia. Take the 269 exit from I-75, and take Barrett Pkwy. west for approximately three miles and turn left at Old Hwy. 41. Turn right at Stilesboro Rd, the visitor center is on the left and open 8:30am to 5:00pm daily, closed Christmas. Weekend during daylight savings time the visitor center is open until 6:00pm. The park is open from dawn to dusk; there is no fee for admission. Call 770-427-4686 or visit www.nps.gov/kemo for more information.